For eCommerce site owners, the holiday season is the biggest part of the year. In 2015, online shopping sales increased by 20% between Black Friday and Christmas. The report also shows that Black Friday and Cyber Monday combined recorded sales of $5.84 billion. Ironically, Cyber Monday also has the highest record of site crashes. And it’s projected that 2016 will see even more site crashes during the holiday. You could be a small or a big player, but with the rapid growth of the eCommerce industry, it’s important that you implement the right strategies to thrive in the industry. One of the best strategies: Being proactive about your website maintenance. 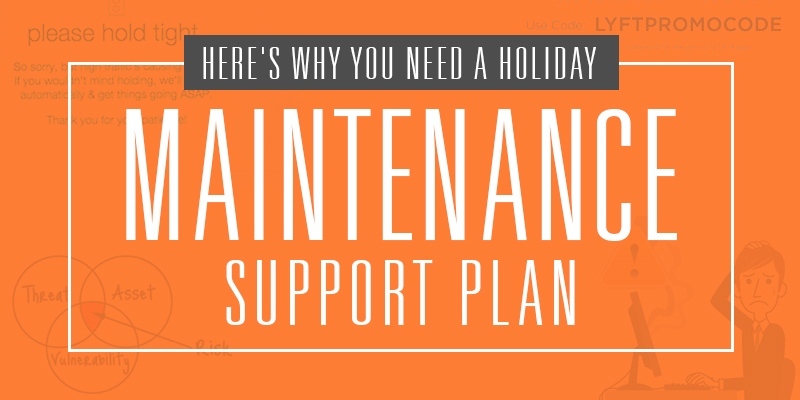 Around the holidays, most companies either hire a maintenance support team or increase their internal support group. You know why? It’s because you may face some unpleasant surprises. What surprises? Here are just a few you might experience this year – All of which can be taken care of by a strong support team. Website downtimes can be extremely hard. The holiday season attracts many new visitors to your site and there’s a high chance that they abandon your website. According to a channel advisor from CNBC, for each hour of website downtime, eCommerce sites could lose around 8% of their day’s sales. According to a Dynatrace survey of 5,000 shoppers, 75% of them said they would readily abandon a site or an app that is slow, buggy, unsecure and prone to crashes. Website delays, performance issues and high page loading times can cost you a fortune in lost sales. Ensure your site loads in not more than 2 seconds. Otherwise, you could lose 79% of your buyers just because your site took too long to load. Through the help of traffic management and website monitoring tools, your support team can give you heads up on your website downtime by using tools like Pingdom, Yottaa and many more. Use these to monitor uptime and incident management. The holiday season is full of discounts, offers, gift cards and freebies and they’re the reason why customers flock to your website. But it doesn’t really work well when you provide them with promotional codes that don’t work, aren’t up to date or our flat out wrong. Your maintenance support team will not fail to double check your offer codes and make sure you roll out your scheduled promotions on time. They can set up specific parameters and ensure that your codes are active, match and tracked in a discount code library. The holiday season is also the season when cyber crimes increase. There are nearly 1.5 million annual cybercrimes, averaging 4,000 cyber-attacks a day! It’s crucial to set up a separate security team (This usually comes with your maintenance support) who will thoroughly look into the security issues on your site. They will assess your SSL validity and terms of expiration. Ensure your customers change their passwords on a regular basis and encourage your admins to use two-factor authentication. Stick to industry security standards and be sure to check if they’re compliant with the PCI (Payment Card Industry) standards. There’s an alarming number of customer data records that are stolen during the holiday season. Your security team will monitor your network security, update patches and secure your scripts. Security must be a priority for you this season! Is your site prepared for the traffic surge? If not, be prepared for a site crash! Site crashes are the last thing you ever want to see during the holidays. Your support team should help you choose the best hosting provider that can balance your load traffic evenly. You can also opt for flexible hosting plans that can be scaled up later. If you’re on Magento, then Rackspace has you covered! The holiday season can drive you crazy. That’s why it’s incredibly important to have maintenance or a support team who can continually monitor all aspects of your store. Need a reliable and thorough maintenance team? Let us take care of your site maintenance while you simply focus on making great sales. Our Magento support team will be available 24/7 to monitor your site. You’ll love our custom made holiday plan which is also your stress buster plan!